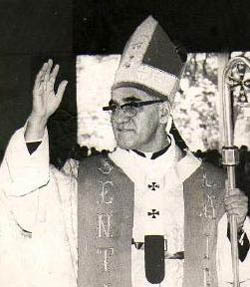 Archbishop Romero minutes after he was shot celebrating mass at a small chapel located in a hospital called "La Divina Providencia" at around 6:30pm on March 24, 1980. Washington, D.C., March 23, 2011 - Thirty one years ago tomorrow, El Salvador’s Archbishop Oscar Arnulfo Romero was shot and killed by right-wing assassins seeking to silence his message of solidarity with the country’s poor and oppressed. The assassination shocked Salvadorans already reeling in early 1980 from attacks by security forces and government-backed death squads on a growing opposition movement. Romero’s murder further polarized the country and set the stage for the civil war that would rage for the next twelve years. In commemoration of the anniversary, the National Security Archive is posting a selection from our digital archive of 12 declassified U.S. documents that describe the months before his death, his assassination and funeral, as well as later revelations about those involved in his murder. Presents draft of letter to Pope John Paul II outlining areas of concern in Central America and requesting assistance in persuading Archbishop Romero not to "abandon" Revolutionary Governing Junta in favor of more radical leftists in El Salvador. Unclassified, Cable, “Text of Archbishop's Letter to President Carter“, 1 pp. Confidential, Cable, “Reply to Archbishop's Letter to President Carter“,1 pp. Confidential, Cable “Archbishop's Homily, March 23”, 4 pp. Confidential, Cable, “Archbishop's Assassination: Peaceful Procession”, 2 pp. Unclassified, Cable, “White House Statement on Archbishop Romero's Assassination”, 2 pp. 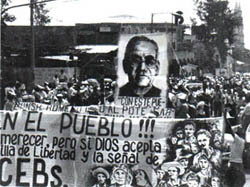 Radio Venceremos clandestinely broadcasts an interview with “disillusioned army officer” Lt. Col. Ricardo Bruno Navarrete implicating Roberto D'Aubuisson, and members of the Salvadoran armed forces in the assassination of Archbishop Romero.